This book assesses how low carbon generation, the advance of energy storage and consumer-based models can help decarbonise electricity supplies at a national level. 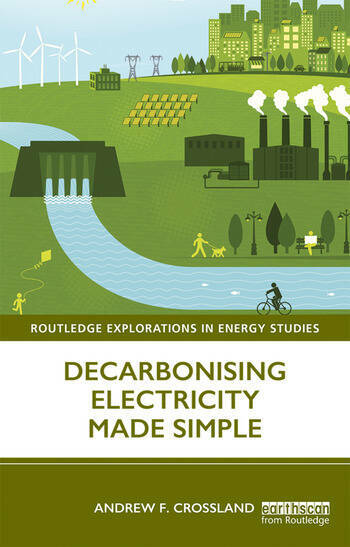 The book is built around developing a decarbonised electricity mix for Britain which reduces fossil fuels from 50% of supply in 2018 down to levels within 2030 carbon targets. Crossland explores the idea of a future energy storage mix which blends domestic batteries, vehicles, thermal stores and pumped hydro to provide a flexible, responsive electricity system. He then goes on to look at how much storage can contribute to decarbonisation in a multitude of contexts – from domestic to national electricity. The book also discusses how efficiency and self-sufficiency can bring about a decarbonised electricity use within our homes today. Britain is used as the main example, but the themes and conclusions are applicable to a global audience and each chapter draws on practical case studies from around the world to illustrate key ideas. Drawing on the author’s experience in delivering and analysing low carbon energy projects in the UK, Sub-Saharan Africa, Latin America and Oceania, this book will be of great relevance to students, scholars and industry specialists with an interest in energy technology, policy and storage. 5. What Makes New Energy So Different? Andrew F Crossland is a specialist in the social, technical and economic modelling of energy systems. In 2017, he won the "Rising Star" Award from Energy UK recognizing some of his work in the rapidly changing electricity system including work on the platform MyGridGB. His PhD from Durham University focused on the techno-economic assessment of energy storage in integrating solar PV on electricity networks.